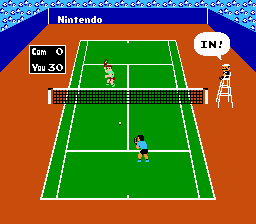 A NES game of Tennis. 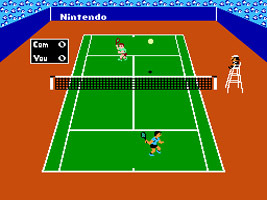 Play against the computer or take on a human opponent in Singles or Doubles matches. Hit the ball over the net and try to get it past your opponent to score a point, and your opponent will try to return the ball. Win a match and you will move on to tougher opponents. The umpire who appears at the side of each match bears a striking resemblance to Mario. While this cameo is fairly well known, it is notable for being the earliest known cameo appearance in any Nintendo game.